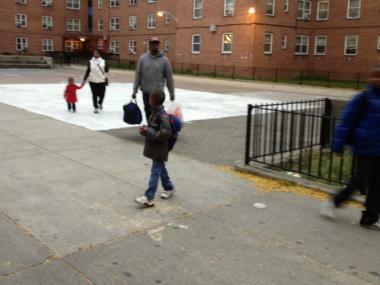 Teacher Erin Burns, 26, and her husband, Marcus, 27, evacuate the Red Hook Houses with their children on Oct. 28, 2012. "I just want to get out of here," Erin said. 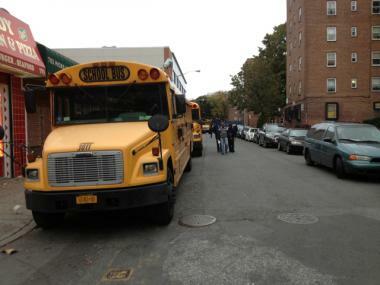 The family is going to stay with her grandmother in Flatbush. NEW YORK CITY — New York City Housing Authority buildings in hurricane evacuation Zone A will see their elevators and heat shut down by 7 P.M. Sunday in preparation for Hurricane Sandy's arrival, officials said. NYCHA workers are going door-to-door in to public housing apartments in the zone alerting the more than 45,000 people who live in the zone that they need to leave their homes. Mayor Michael Bloomberg said shutting off power to elevators would prevent residents from getting stuck if the buildings lose power. He added that heat and hot water would also be shut off for the approximately 45,000 residents living in the public housing developments in Zone A as a precaution. “If the electricity goes out, the elevator will stop and people could be trapped in them,” he said, adding that the authority would preemptively shut down the heat and hot water to mitigate problems with the electrical system in the building. For residents staying home in the city’s public housing units, NYCHA officials urged residents to prepare emergency “go bags” and make sure to have enough water, flashlights and extra batteries. Officials asked that residents keep all windows closed and locked with drapes drawn to protect against possible broken glass and help close and lock all windows in stair halls, lobbies and other public spaces. In case of an emergency, residents are asked to call NYCHA's Customer Contact Center at 718-707-7771 or 911.